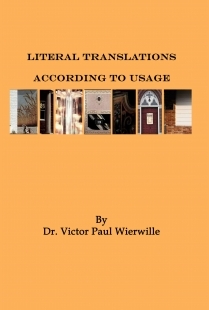 "Dr. Wierwille asked me to share with you the definitions of different translations. For example a literal translation. You all know what it is. If not, I'll give it to you. A literal translation is a word-for-word translation. You have it in your interlinear with a very literal translation. But a literal according to usage is what we generally try to express in our translation work. A literal according to usage is a translation which reproduces the thoughts and meanings of the original based on the words in the original in relation to the verse, the context, the remoter context, and to whom it's written, that expresses the heart of what a translation ought to be. A literal according to usage in which you would not try to reproduce the construction of the original, but rather the thoughts and meanings of the original. That's to be based on the actual words that are in the original in relation to the foundational principles: the verse, the context, the remoter context, and to whom it's written. Then an expanded translation. This is another thing which we have done in the ministry. An expanded translation is a translation which reproduces the original with many alternative meanings and explanatory renderings. This would go into greater detail to expound what a literal according to usage would give you. It would give you much more explanation in order for you to understand that thought and the meanings of the original. A free [translation] or paraphrase (which we do not do) is a translation which gives the gist of the original without corresponding to each word used in the original. It would be a very free translation, a paraphrase, giving only the gist, rather than trying to stick as close as possible to the words of the original. That's how it differs from an expanded. There have been translations done along that line."